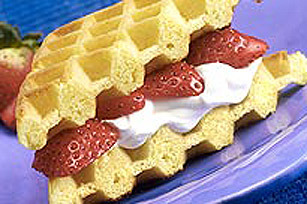 Who needs maple syrup on their waffles when you can sandwich them with whipped cream and fresh strawberries? Frozen waffles have never tasted so good! TOAST 1 fresh or frozen prepared waffle in toaster. Cut in half. SPREAD 2 Tbsp. Cool Whip Whipped Topping on one half of toasted waffle. TOP with sliced strawberries and other half of toasted waffle.